Document Signed (DS). Parole. 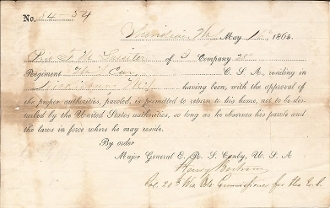 Meridian, Miss., May 16th, 1865 for Private F. M. Lassiter (Co. I, 28th Mississippi Cavalry). Signed for Genl. Canby by Henry Bertram as Colonel 20th Wisconsin Infantry. Bertram was made Brevet Brigadier General on 3/13/65. Usual folds, some age spot, othrewise fine.